This is a family of economically priced quantum sensors and meters calibrated for either sunlight or electric light, with self powered or amplified voltage output options. Line sensors are also available that incorporate a number of sensors mounted in a single bar and provide a spatial average over the sensing area. Specify calibration for sunlight or electric light. This basic quantum light sensor with cosine-corrected head has a domed diffusion disk and head for improved self-cleaning characteristics and long-term stability. Can be mounted to the leveling plate with internal 10 x 32 threaded insert. This sensor approximates the radiation between 400 and 700 nanometers, which are the most important wavelengths for plant growth. Designed for continuous outdoor use. Can be submerged underwater. MQ-100 - Meter with integral quantum sensor. Calibration switch for indoor or outdoor use. MQ-200 - Meter with external quantum sensor. Calibration switch for indoor or outdoor use. 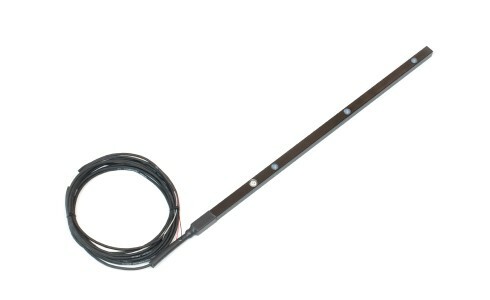 The AL-100 is required for sensors on cable. The AL-210 is used for mounting meters with integral sensor. The AM-110 fits the AL-100 leveling base and can be mounted directly to a mast or pipe with an outer diameter of 33-53 mm. The AM-001 is designed to fit to the back of a meter for mounting a sensor on cable. The AM-310 is for placing sensors in difficult to access places, such as underwater or under canopy. The AM-320 is a salt water version. Apogee Line Quantum Sensors provide a spatial average of quantum light over the sensing area. There are three standard units from which to choose: 3 sensors mounted in a 50 cm bar, 6 sensors mounted in a 50 cm bar and 10 sensors mounted in a 70 cm bar. These can also be selected with either sunlight or electric light calibration, or with a meter. Apogee manufacture a specialised range of sensors for biophysical studies including light sensors, oxygen and surface temperature (IR) sensors. All Apogee products are covered by an industry-leading four-year warranty against failure due to defects in materials and workmanship.